In most cases of divorce or separation, one spouse always moves out of the marital home while the other spouse keeps possession of the house or apartment. However, if both spouses are on the lease or co-own the house, it is not possible for a spouse to force the other spouse to move out; the spouse has to move out voluntarily. There is an exception for spouses who have been granted a court order to keep the other spouse away from the home. If the marriage is over and the spouses are living under high conflict conditions, continuing to live together can be very stressful and cause the divorce to take more of a negative toll on the spouses and any children involved. The best option may be for one of the spouses to move out, but this can be difficult if one or both spouses have nowhere else to go live after living the marital home. 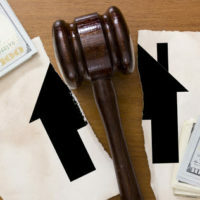 In addition, spouses may believe that moving out of the home will surrender a right to get the home or a portion of the value of the home in the divorce. Staying in the marital home is also thought of as a way to show that the remaining spouse is the more stable parent who should be granted primary custody of the children. Moving out of the family home will not mean that the spouse who moves out automatically loses all the rights to the home in the divorce. The court may consider the fact that a spouse left the home, but is still required to divide the property equitably as required under the law. When a spouse moves out of a co-owned home the spouse will still be required to continue making his payments on the mortgage, property taxes and other shared costs to keep the home. Making these payments can be viewed positively by a court when it comes to dividing the property. For a couple that is living in an apartment or a house under lease, both spouses are considered responsible for making rent payments. If a spouse moves out and the other spouse cannot pay the rent, the spouse that moved out can be pursued for the missed payments. There is usually no real concern about moving out from a rented marital home if a couple does not have children because it is not property that can be divided in the divorce. Similarly, the court makes decisions on child custody based on the best interests of the children. However, if a spouse moves out and effectively abandons the children, then the moving out can count negatively in terms of being awarded custody. If a spouse is in an abusive marriage and needs to leave the marital home for safety, the spouse should leave with the children if possible and get to safety. There are many considerations that go into a decision to move out of the marital home. It is not a decision that should be made lightly. A spouse considering filing for divorce and moving out of the marital home should consult with an experienced divorce attorney before making the decision to move. For more information, contact an experienced divorce attorney at the Media, Pennsylvania law firm Barbara Flum Stein & Associates serving Delaware County in all family law matters to schedule a consultation.